Prudencia hoped for friendship in San Ireneo but she didn't suspect that she might find love—nor that the course of her new life would run quite so rocky or would offer challenge and heartache as well as joy, discovery, and fireside debate. 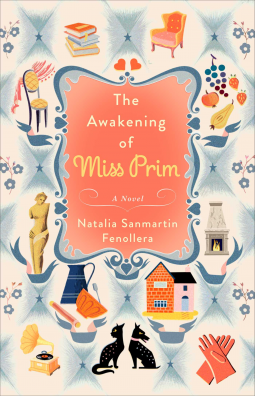 Set against a backdrop of steaming cups of tea, freshly baked cakes, and lovely company, The Awakening of Miss Prim is a distinctive and delightfully entertaining tale of literature, philosophy, and the search for happiness. This was a hard book for me to initially get into. This is definitely 'not' Women's Fiction, Chick-Lit or anything related, so if you are looking for that in this book, you are not going to find it at all. This book is Literature. Sometimes I feel literature can be a tad boring at times, and that is the way I felt with this book. After reading the first quarter of this book, I felt like I almost could not go on. I went on, despite. It took me about half the book before I could like the book a 'little' more. After the halfway mark, it got a little more interesting, but I thought Miss Prim would have an awakening to life and love, but the love never came. Yes, there was a discussion between her and her employer, but that went nowhere. The last quarter of the book was the best because that is where she finally came into her own. Did I feel moved by reading this book? No. I was kind of glad it was over. Sorry to say this, but this is my opinion of which I am entitled. I felt this book was trying to give us an old fashioned feel to it, and it did, even though it took place very much in the modern day, Overall, while I did read some other reviews about this book to see if what I felt about this book was spot-on or not, I found the average rating for this book is 3-stars, at least according to Goodreads, so I am correct in my rating I felt it deserved. I then went to Amazon to see the ratings there, and there are only four so far. 2 at 5 stars, and 2 at 2-Stars. From that as well as the Goodreads reviews, I found either you loved this book, or you just did not. Sorry to say, I was not one who loved this book. Miss Prim decides to take the position of a Librarian in Spain to a man who sat in a wingback chair. That entire scenario was a bit strange, as he was always sitting there with his back against her. She was in charge of reshelving all of the books in this man's library/her employer, There were a lot of books to shelve, which did require a Librarian. She put the books in the right places, labeling them correctly, and also shelved children's titles as well. (This part was a bit boring to me, but then again I am much more into Women's Fiction and Chick Lit than Literature, I guess, or perhaps this is what I learned while reading this book?) She and her employer had a few discussions, and she discussed some of the women's classics she loved, but this man/her employer did not like them and was quite adamant about his opinions. The townspeople were lovely people. They were highly opinionated, quite eccentric, and extremely concerned that Miss Prim was not yet married and did not have a few kids of her own by now. She tried to explain she still had more than enough time yet before she felt the need to settle down. Miss Prim and her employer even had a discussion about this, but that is all. The last quarter of this book Miss Prim blossoms into herself. (I guess you could say this is where she had her awakening.) She starts to thrive as she decides to travel, and one of her favorite stops is in Italy. She is very happy there and she really starts to find herself now. I really wish the rest of the book was written more like this. If it had been, I know I would have enjoyed it more. I received this book for FREE from the Publisher, Atria - A Division of Simon and Schuster, and NetGalley, in exchange to read and write a review about it. "Free" means I was provided with ZERO MONIES to do so, but to enjoy the pure pleasure of reading it and giving my own honest opinion no matter whether it is positive or negative. I am disclosing this information in accordance with the law set here: http://www.access.gpo.gov/nara/cfr/waisidx_03/16cfr255_03.html., The Federal Trade Commission's 16 CFR, Part 255, 16 CFR 255, Guides Concerning the Use of Endorsements and Testimonials in Advertising Federal Acquisition Regulation.